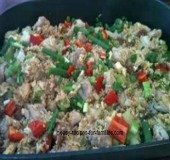 Do you want to know the secret of how to cook rice perfectly? 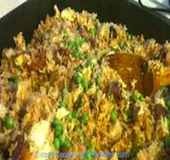 While there are the two main methods to cook rice, one of which is to boil it furiously like you would with pasta, the other, the absorption method is the correct way to cook rice. 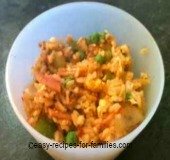 The result, if you follow the instructions is a delicious fluffy rice with grains cooked perfectly so that it is not dry and best of all, not gluggy. To "dress up" a serving of this lovely sides, just stir through some frozen green peas when it's cooked but taken off the heat. Be sure to return the lid and cover it tightly for the remainder of the cooking process. There is no need to add salt. The objective is to have it a natural flavor with the focus on your hero or main dish. The Ingredients are Rice and Water. Bring it to a rapid boil on high. 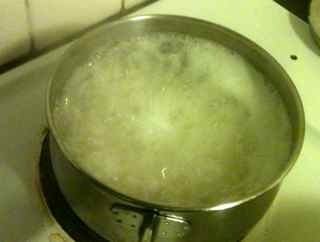 If you're using an electric stove, the residual high heat will mean that the water may boil over. Tip the lid so that it is able to cool down sufficiently to prevent a mess from spills. Then put the lid on firmly for it to simmer gently for about 12 - 15 minutes. Don't stir. Don't keep peeking at it. It's perfect after the 10 minutes of cooking in its internal heat. It will look like this - you can see full individual grains and it is not sticky. And...it's ready to be served. This makes sufficient for 4 modest serves of sides of rice. •	Turn the stove off and let the pot sit, covered for about 10 minutes. The internal temperature is sufficient for the remainder of the cooking process. 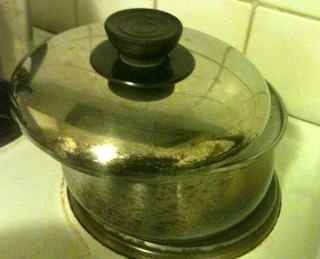 •	I have an electric stove and I leave the pot to sit on the hotplate while it cools down. 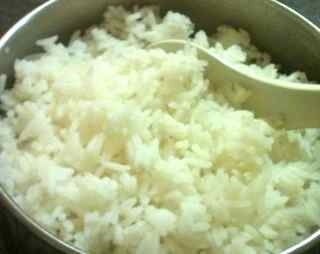 This fluffy white rice is a perfect accompaniment to tasty dishes like stews and casseroles as it does not compete in flavor with the hero dish. 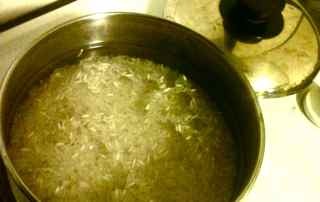 For a lovely fragrant rice, I use Jasmine or Basmati Rice. Long grain rice is preferred for presentation as the fibers retain their elegant long shape during the cooking process, although there is no difference in nutritional value between short and long grained rice. 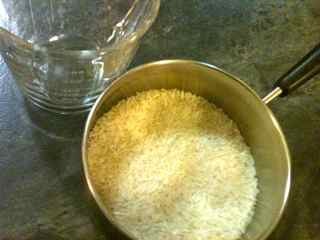 For risottos and puddings where the end product is a sticky soft rice, use Arborio or short grained rice. The shorter fibers break down easily while cooking. 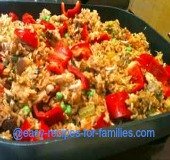 I cook 2 cups of rice for my family of four as the children have hearty appetites and it leaves enough to serve for lunch the next day. 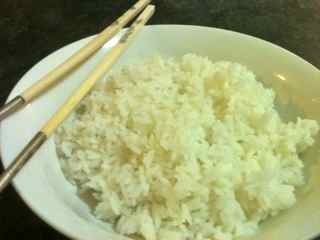 You'll find some Asians insist on washing the raw uncooked rice. This is not, as it is assumed to remove surplus starch, but to clean it. In days when hygiene was not paramount, harvested rice grains would be dried on sheets on the open ground to sun dry. You can imagine it would've been subject to all sorts of contamination - that's why rice grains were washed before cooking. Nowadays, of course, food standards would never permit contamination to occur. 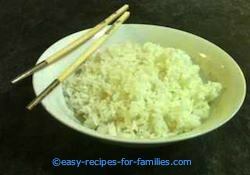 Enjoy this recipe and how to cook rice the easy way the Asians do. 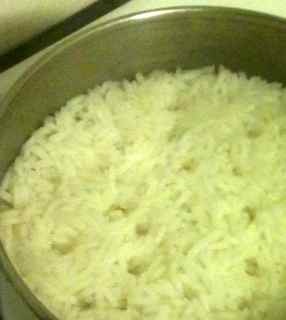 This is how to cook rice for the perfect result!